As we dig into the Corvallis Mill Race, we continue to find surprises. 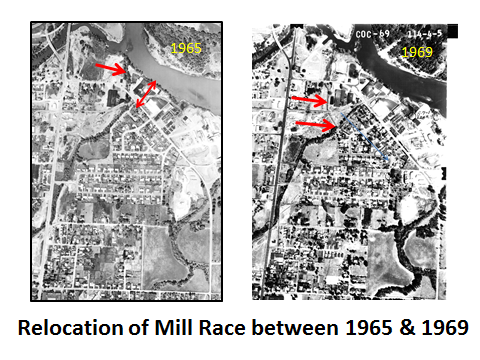 We knew that some time between 1967 and 1969, the historic Mill Race was closed off beyond Crystal Lake Drive and diverted to a newly-created channel passing north across Evanite and City land. The new outlet emptied into the Marys River just upstream of the confluence with the Willamette River. The new channel was much too small to allow full drainage of South Corvallis storm water. A 20” culvert placed under the Southern Pacific Railroad spur and the existing culvert under what was then called Chapman Place toward the western end of the Evanite property were both significant bottlenecks. The geometry of the new ditch, specifically the 90 degree turn where the new channel connected to the old, also created fundamental flow issues. Extensive review of both City and County records had failed to yield any records of local government involvement in the planning of this channel realignment. Just last week, a search of on-line City archives finally told the story. City Council minutes for June 19, 1967, state that Evanite personnel met with the City Manager and unspecified staff members to discuss how the Mill Race could be modified to better serve as a drainage conduit for the South Corvallis area. Evanite’s interest was presumably prompted by its desire to fill in the Mill Race at its eastern end, to improve access to and around the hardboard plant. Evanite had stopped using Mill Race water by 1958. Council minutes for October 2nd state that Mill Race modifications had been made, and included “trespass … across City lands at the mouth of the Mary’s River.” The clear implication is that this was done without City approval or even further consultation. Note also that the minutes refer to use of an existing culvert under Chapman Lane (known at the time as Crystal Lake Drive). The minutes for October 16, 1967, refer to a Public Works Department report of October 12th that stated that the realignment was indeed done without “consultation or approval of the City of Corvallis.” We have not yet located a copy of the October 12th report. It appears that no action was ever taken by the City against Evanite, despite clear evidence that the realignment greatly impeded drainage of flood waters from South Corvallis. Corvallis finally rebuilt all the affected parts of the Mill Race, at city expense, but the last stage of the work was not completed until 1997, presumably in response to the disastrous flood of 1996. Friends & Family Night at McMenamins!